This tour is designed as a relatively moderate ride. Average daily cycling mileage will be about 30 miles (50 km). On most days we will use vehicle transport to supplement the cycling to get us to the next destination. Riders will carry their own luggage in their bike panniers . This tour will visit both well-known and little-known sights and will appeal to those who have cultural, social and geographical interests. The following morning, the group will fly to Xiaguan and then get transport to Old Dali. Old Dali still has some of that small town charm and ideally located between the Cangshan Mountains and Erhai Lake. In the afternoon we will visit the Three Pagodas and Chongsheng. On the third day we will cycle half way around Erhai Lake, visiting several villages, temples and Jinsuo Island before returning to Dali via boat. Next the group will head north to Jianchuan cycling along the old Dali-Lijiang road where numerous minorities can be seen along the road in traditional dress. In Jianchuan we will have an opportunity to visit the Jinhuashan Precipice Bas-relief Grottos. Continuing north will we cycle along side the Yangzi River and view the First Bend (where the river makes a U-turn and heads north) on the way to Qiaotou, the gateway to Tiger Leaping Gorge (which will be visited later). 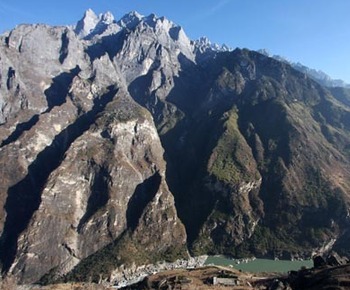 The following day we will to see the Tiger Leaping Gorge. Tiger Leaping Gorge is one of the deepest and most dramatic gorges in the world and is still quite wild despite the enormous efforts to tame it. We will visit the narrow spot of the gorge where it takes it name. It is a powerful spot with the whole of the Yangzi River confined to a 20- meter (70-foot) width. We will spend the night in the gorge in simple cabin-like lodgings. The next day the group heads to Lijiang, the center of the creative Naxi minority group spending a day to explore the city and view several temples and the Baisha Frescoes. On the eighth day, we will return to Kunming via air concluding the bike tour. 3. All group transportation costs (buses, boats, and taxis). 5. Bilingual bike tour guide to accompany the group throughout the tour.